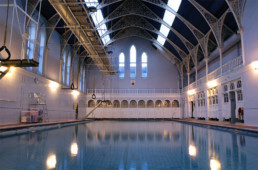 An outstanding, extremely rare and intact example of an early private members’ swimming facility in Scotland. The building emulates the form and air of a Venetian Palazzo. 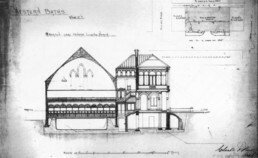 The interior features a grand imperial staircase and columned entrance hall; arcaded round-arched hall screen; arcaded, glazed screens with geometric glazing bars to poolside changing rooms; lancet windows in pool hall gables; decorative cast-iron roof brackets to pool with initials W and B detailed in the roundel; early pool apparatus, including hanging rings and trapeze; spittoons and corner steps to pool; extensive polychromatic floor and wall tiling; top-lit cooling room with carved cornice; panelled rooms. 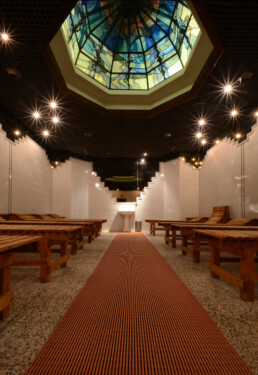 Pool, Turkish Baths suite, gym, sports hall, exercise room, billiard room, crèche, meeting room, bar and bistro. 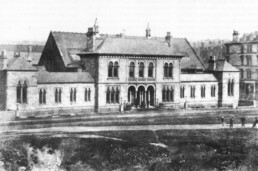 Western Baths Club has been in continual use as a recreational facility since first opening its doors in 1876. 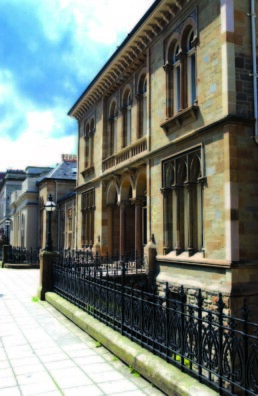 The Western Baths Club is thriving and a wonderful example of a swimming baths that has survived difficult times and now boasts over 2,600 members and a waiting list for membership. The Club organises a range of special activities and events.